Could your vendors be your weak link? While you may be investing in your own cybersecurity program, you need to ensure your vendors are doing the same. Your third parties could be the weak link making you vulnerable to data breaches and more. 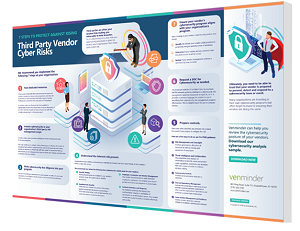 By taking the necessary precautions and understanding your vendor’s cybersecurity posture, you can reduce the risk of your third parties becoming your weakest link. To learn just how to protect your organization from third party cyber risk, our infographic covers 7 key steps to follow.